The LTS Area Advisor Team have begun putting together a blog aimed at practitioners in primary, ASN and early years settings. Practitioners like to talk to other practitioners and they do this with increased confidence when what they are discussing is based on successful real life experience. To this end, a new blog is now available to support CfE in primary, ASN and early years settings. It has been set up for people who are working at the ‘chalk face’. Visit the blog to hear what other practitioners have been doing and see the links to other related support and guidance on the LTS website. The blog will be looking at ‘what could I do now and how might I do it’ in a range of areas. Well done to those who’ve been involved. Check out the blog for more videos. 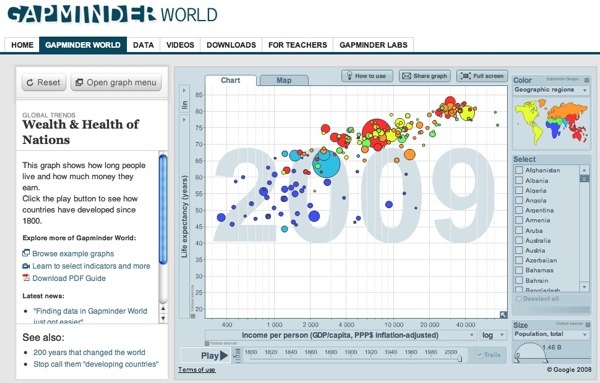 Have you heard about Gapminder? This could potentially be a fantastic resource for lots of pupils & teachers…it even has a section on the website with support for teachers. I’ve been writing a class blog about things we’ve been up to in Primary 1. In what ways does this relate to Curriculum for Excellence? I think that the blog allows the children to share their success in school at home. Also I feel it covers ‘I enjoy exploring and using technologies to communicate with others within and beyond my place of learning’ (TCH 0-04a) quite nicely! What were the reasons for doing this? It’s a way to communicate to parents what their children have been doing in school. By looking at the blog with their parents the children are able to talk about what they have been learning about in school. Sometimes I write the posts with the children, so they are keen to look at the pictures at home. 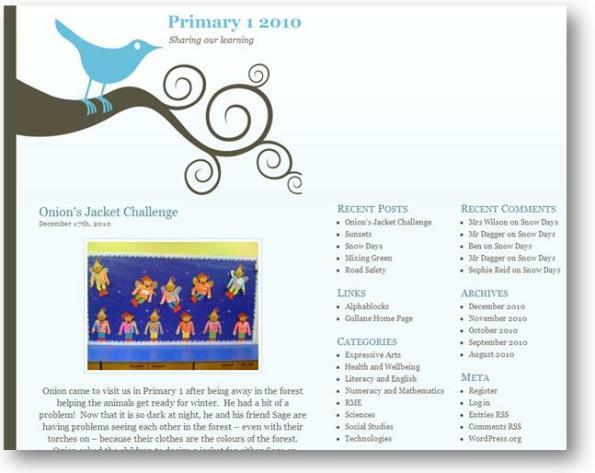 The blog also links to the children’s learning logs, which they take home every Friday. I often comment that a piece of learning a child has written about can be found on the blog. What has happened as a result? I’ve had a lot of positive feedback from parents. They enjoy using the blog to stimulate discussion at home about what their children have been doing. The comments left are brilliant to share with the class, and allow me to assess what the children have remembered about activities we have undertaken. This encourages them to ask their parents to look at the blog again and leave more comments! I think it’s an ongoing, evolving process. Last year I had a separate page called Onion’s Patch which I had big plans for, but never got round to getting it up and running properly. I think I am going to try again this session. Also the class have been writing notes for my dog to read ever since I posted a picture of him in the snow. I was thinking about posting pictures of him with their work – to encourage independent, spontaneous writing in class, and engage more reluctant writers. Thanks to Mr Dagger for sharing! If you haven’t got a blog going with your class, perhaps it’s something to think about? You can sign up to eduBuzz here.